Glue colorful beads on a pine cone. It becomes tiny Christmas tree. Big and symmetrical cone is better. Stuffed ferret, 25 centimetre length and 13 cm height. Furry coat of creme and chocolate, with felt nails. 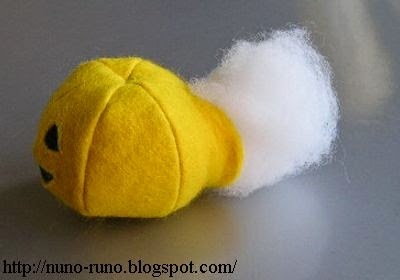 This is a trial-made ferret. I think the face and body should be longer. But the shorter is pretty. I haven't seen a genuine ferret. But I've seen a lot of books about ferrets. Generally, a ferret's face seems to be round at the front, and sharp in the profile. Origami is traditional craft in Japan. A piece of paper becomes various things. Most children know how to make a paper crane. A dachshund of strong paper. We can put light things in its back. 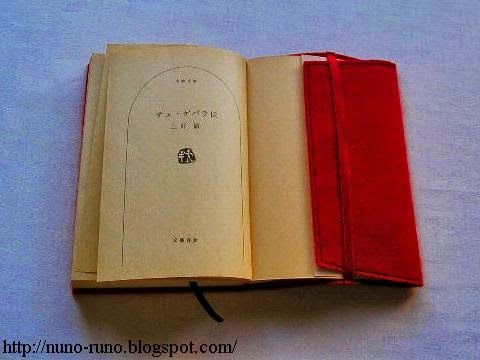 There are lot of origami books, but they are difficult to try. 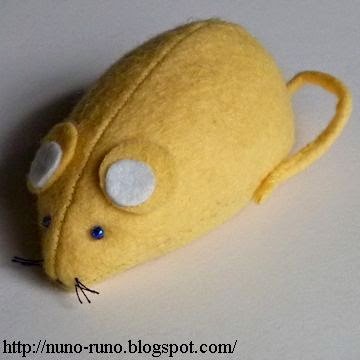 In Chinese calendar, 2008 is mouse year. 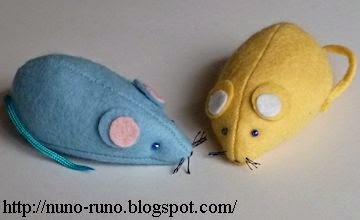 We send the New Year's cards which were decorated with the picture of mice. 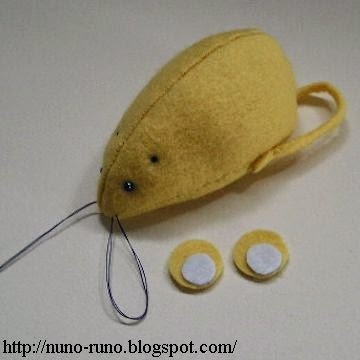 Why not make felt mouse? Cutting. The tail and ears don't need seam allowance. Sew the tail. You may use a cord as the tail. 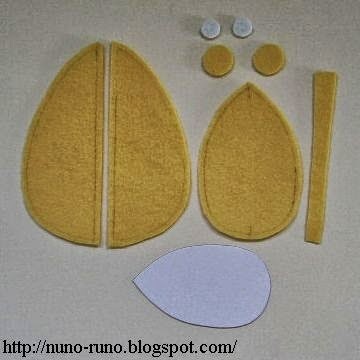 Sew up the body and bottom. Put thick paper into the body. Sew eyes with beads. Stitch whiskers. Glue or stitch the ears to the head. 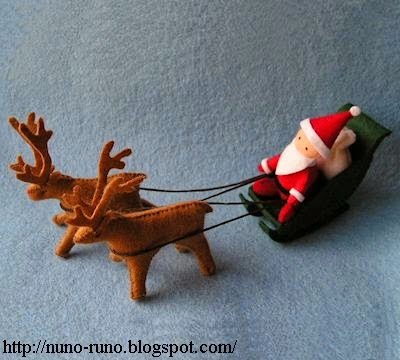 Mini Santa Claus doll and reindeer of felt. Pattern and process is this page ... Mini Santa. 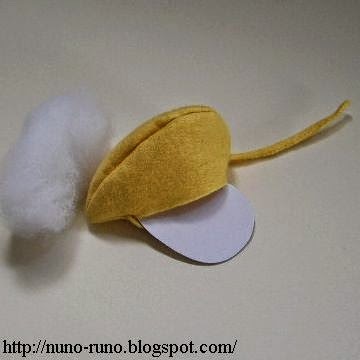 Felt mascot of Mickey Mouse. 9.5 centimetres. 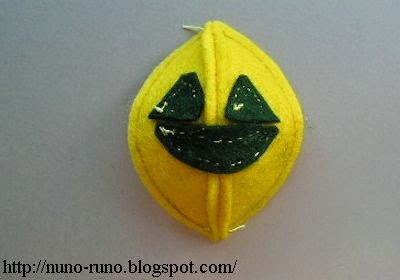 The making process is the same as Stitch. I sewed it. But I suspect the merit on making such thing. It takes much time, and doesn't look so good until getting skills. Moreover, we can buy cheaper and better goods at a Disney shop. Its tail is a thread. This has flat body. 10 centimetres. I got the pattern from a book. I don't have copyright. The pattern is slimmer than snowman. Sew up 2 front pieces. 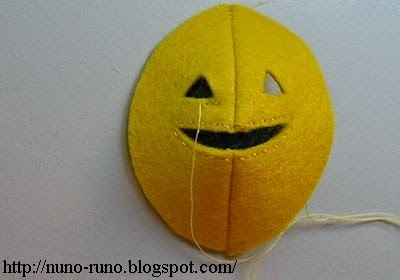 Patch a small piece at every hole of eyes and mouth and stitch around. Make a globe with 6 pieces. Turn inside out and stuff polyester fiberfill in it. Close the opening. 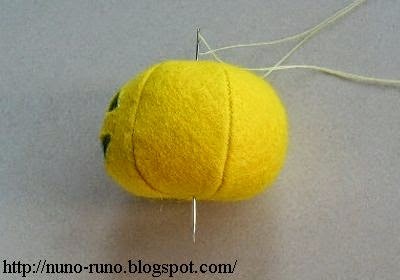 Stitch and pull the center with a thick thread. 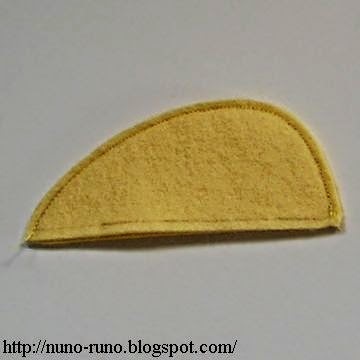 Roll a green piece of felt and stitch it on the crown. This is a stem. 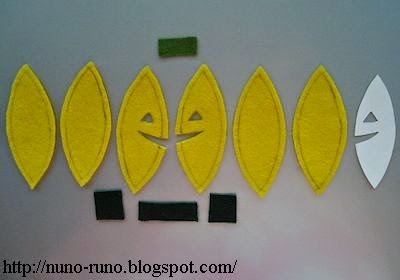 If you think holes are difficult, make applique. I had heard that there is not delicious food in England. I didn't think it was truth. I found Jaffa cakes. In my country, it is difficult to get Jaffa cakes. Perhaps I can buy one at an import shop, but it must be high. And I need to diet. I made Jaffa and cookies of felt, eat them by eyes. The other day, I tried to remove a core (stalk?) of a cabbage. I stuck a kitchen knife into the cabbage. When I pulled it out, I saw the tip of the edge disappeared. I could not find the fragment after all. Is it in my stomach? Anyway a tip of knife is not so necessary for cooking. A felt caterpillar with a red ribbon on her head. 3.5 inches length. 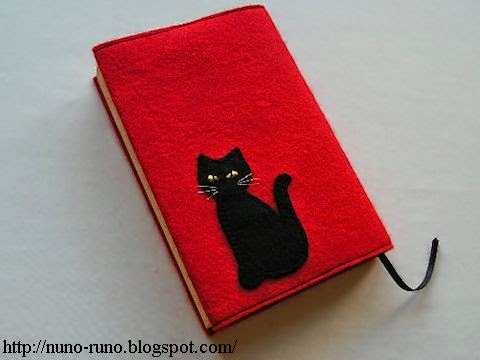 Made a book jacket of felt. Felt is easy to sew because it does not fray at the cut end. It needs the margin of the length a little. The right side is tapered. 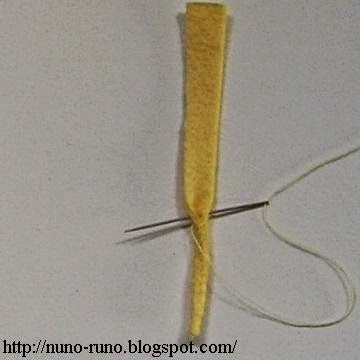 Fold the left side and stitch around the hem. Sew 2 ribbons. One is a bookmark. Another is a holder of turnup. 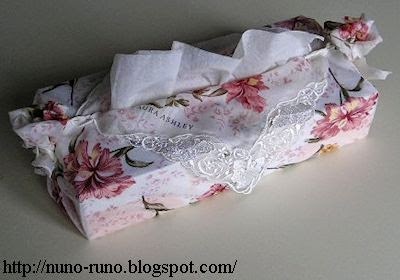 Why not cover a simple tissue paper box with a handkerchief? 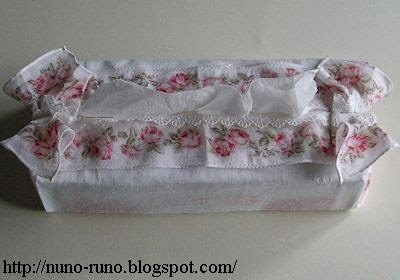 The hankie is not cut, so you can restore it as before. I used marking pins. Because I would unwrap it soon. But it may be danger. 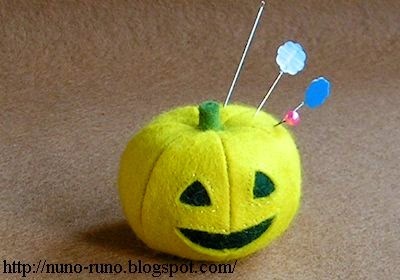 Use safety pin, or sew it roughly. Place a box on diagonally. Twist a corner to be like a flower. 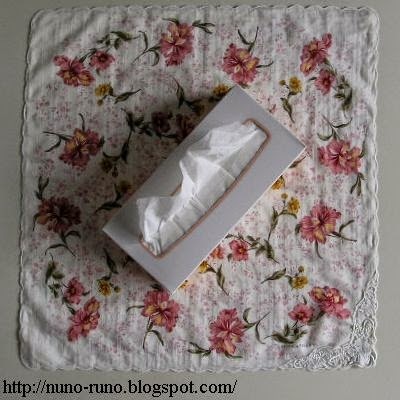 This is a Nina Rich handkerchief. Fold the hanky and place a box on. Wrap the box and spread the sides. Kokeshi is traditional folk toy in Japan. It is a wooden doll with globular head and cylinder body. It has no limb. The features and clothes are painted. There are old kokeshi in my family home. A pouch of quilted cloth. Refer to How to make a pouch for making. Measure your digital camera. Plus 1.5 - 2 inches for margin. Plus 1/4 " for seam allowance. Fine fabric is good for a lining. This quilt cloth is the same as Nekomimi hanten. 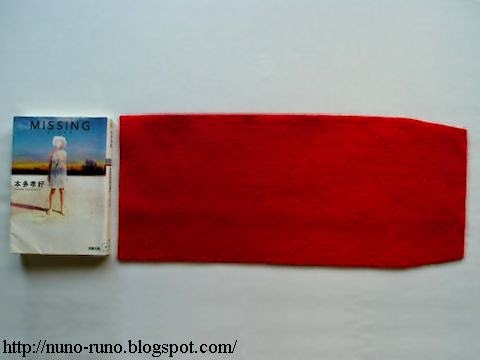 Kinchaku is a pouch which opening we tie with two strings. We put in various things --- cosmetics, fancy goods, lingerie, lunch, confection, stationery, sewing kit, and so on. 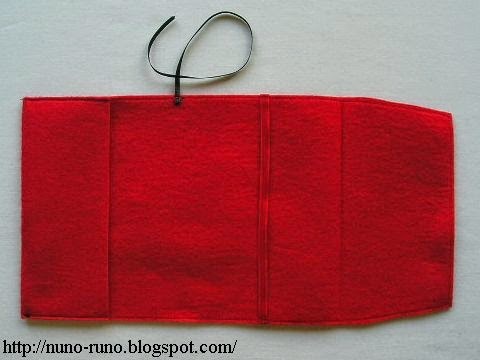 How to make a pouch. When you walk in business quarters, you will be handed various PR goods --- mini tissue, ball-point pen, candies, coffee whitener, sample of sanitary napkin, and uchiwa. Uchiwa is a kind of Japanese fan. Traditional uchiwa is made of wood and paper. This is a plastic bone. It's not that I want to advertise Yahoo in the town. So I changed its cover. First, soak it in water, and remove paper. Second, glue a handkerchief or paper etc. on the bone (both sides). Last, trim off an excess. We hear that female mantis eats male after mating. But the truth is more horrible. It's not only after. She sometimes eats her husband before or during mating. If so, the wedding will be aborted. Don't worry. Insects are tough. The bride starts to bite food from the head. A headless mantis can mate. And even if he loses the head and the breast, it is possible for a while. 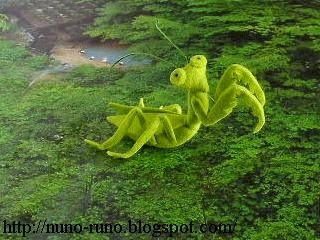 Praying mantis of light green felt. Wires are in the limbs. I didn't know regulations about children's clothes until reading today's paper. 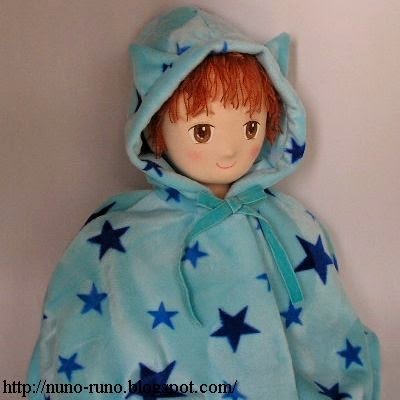 There are some dangerous parts, for example, a hood, strings or fasteners. String may hang a baby. In Japan, there is not any rule. In Europe, the regulation seems strict. Sometimes I make kids' clothes. All are for life-size dolls. 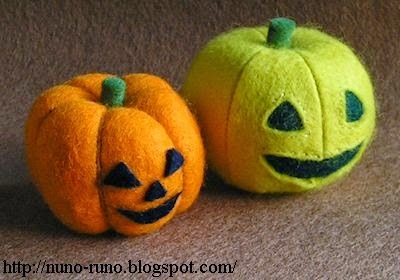 I posted them on my sewing site. Some of my clothes are bad for kids. If you make clothes for your kid, you should replace strings by Velcro etc. This is for a doll.